Breena Buettner is a studio potter living in Helena, Montana and working as the Gallery Sales Manager at the Archie Bray Foundation for the Ceramic Arts. She was born and raised in the plains of Amarillo, Texas where she discovered a love for clay in a high school art class. She earned a Bachelors of Fine Arts from the University of North Texas in 2013 with a concentration in Ceramics and a minor in Psychology and was also a Post Baccalaureate student at Northern Arizona University. In addition to traditional education, she has worked in studios such as Blue Sage Art Gallery, Taos Clay Studio, Anderson Ranch Arts Center and has been a studio assistant for many professional potters. Breena moved to Helena, Montana in 2015 to fire wood kilns, be near the mountains and learn to fly fish. I am intrigued by the unexpected states of change that take place throughout life and the ceramic process. This interest has led me to utilize a wood fueled kiln that inherently makes it’s own marks on the work and gives each piece a weathered sense of something more than myself. For surface design, I attempt to break up the organic flame marks on the piece but creating a segment for a glaze pattern. Simple lines and stripes compel me most because they demonstrate the most drastic state of change when the effects of wood ash loosen up the repetition and cause distortion. 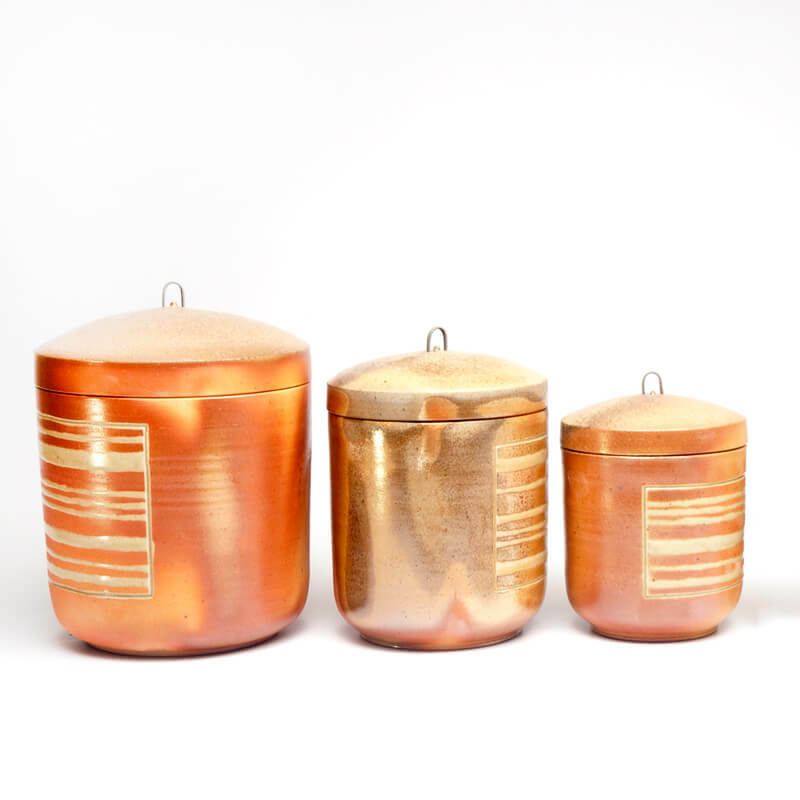 Utilizing cut outs in the form, that mimic the loose and linear glaze pattern, allow for a strict tactile quality that will remain unaltered by the fire and provide a way to see into the vessel or caddy. I aim for this body of work to create a compositional balance between the contrasting appearances of a straightforward glaze design and the organic depths of flame patterning. It is not only a way to balance differences of contemporary and traditional pottery, but also geometric and organic, strict and loose, as well as intended and unknown outcomes.